With two weeks left in Spring Training, Major League roster races are taking shape. And with that comes roster cuts. 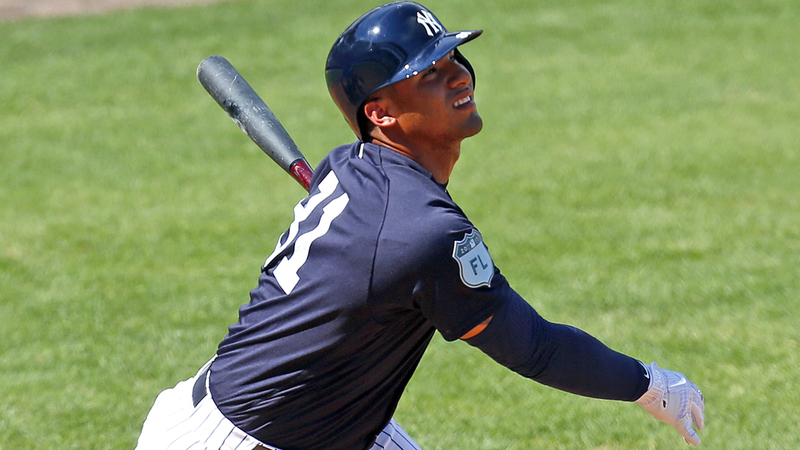 The Yankees reassigned top prospect Gleyber Torres to Triple-A Scranton/Wilkes-Barre, along with catcher Kyle Higashioka, on Tuesday. Torres, MLB.com's No. 5 overall prospect, was thought to be a contender for the New York infield out of camp. The 21-year-old spent most of his time at second base as he transitions from short, all while returning from Tommy John surgery he underwent last June. But with the signing of second baseman Neil Walker on Monday, it looks like the Yankees don't want to rush Torres. The Venezuela native went 4-for-25 with three walks and seven strikeouts in 10 Grapefruit League games. "I think we've kind of seen him wanting to make up for lost time, wanting to prove himself a little bit to a degree," manager Aaron Boone told MLB.com. "From what I've seen, obviously he's about as highly touted as anyone. That's only been confirmed in my eyes, and it may even be taken to another level. There's no question to me the kind of player he is and is going to be." The Padres reassigned their top two hitting prospects, Fernando Tatis Jr. and Luis Urias, to Minor League camp. Tatis' spring was highlighted by a debut in which he went yard in his second at-bat as well as a March 4 game when he went 4-for-4 with five RBIs. Baseball's No. 8 overall prospect finished the Cactus League campaign hitting .281 with four extra-base hits, eight RBIs, three walks and 12 strikeouts in 32 at-bats (12 games). The shortstop advanced to Double-A San Antonio last season before turning 19. Urias got off to a hot start in spring, going 8-for-14 (.572) in his first 11 games before going hitless in his final 14 at-bats. In total, the No. 36 overall prospect posted a .286/.394/.464 line with five doubles, three RBIs, five walks and six strikeouts. "The upside is there," manager Andy Green told MLB.com of the pair. "They're impressive young players. Neither one is a finished product. There's a lot to like in both of them and still a lot of work." Hours after Mets captain David Wright called him the most famous active baseball player, Tim Tebow was sent to Minor League camp. The outfielder went 1-for-18 (.056) with a walk and 11 strikeouts in seven games. Tebow was limited at camp after spraining his ankle when he tripped on a sprinkler head. "He has a good swing, and he's putting some really good swings on some pitches," manager Mickey Callaway told MLB.com on March 2. "He looks comfortable at the plate. And he tells us he's feeling more and more comfortable, like he's in a much better spot than he was last year at this time." The Twins reassigned their top two pitching prospects in Fernando Romero and Stephen Gonsalves. They also sent John Curtiss (No. 21), Adalberto Mejia and Aaron Slegers to Triple-A Rochester. Romero came one walk shy of perfection in Grapefruit League play. The No. 68 overall prospect struck out eight in eight hitless innings across four appearances. After spending all of last season with Chattanooga, Romero will return to Double-A camp. "He's not unlike Lance [Lynn] in some ways, as a competitor," Derek Falvey, the Twins chief baseball officer, told MLB.com. "He understands where things are. He's somebody we believe has a high ceiling. But we're running out of innings for starters and we need to get guys ready on the Minor League side." Gonsalves, the No. 78 overall prospect, also put up strong numbers in his second big league Spring Training. After advancing to Rochester last year, the 23-year-old right-hander allowed one run on six hits with two walks and one punchout in 3 2/3 innings across two games, including a start. Gonsalves was reassigned to Triple-A. The Rangers sent second-ranked prospect Willie Calhoun to Triple-A Round Rock, along with first baseman Ronald Guzman (No. 7), third baseman Isiah Kiner-Falefa (No. 26) and right-handed pitcher Connor Sadzeck. Texas also reassigned catcher Jose Trevino (No. 20) to Double-A Frisco. Although he just moved from second base to the outfield last season, Calhoun was in contention for a left field spot in Arlington. In his first Rangers camp since being traded from the Dodgers in the Yu Darvish deal last July, the No. 53 overall prospect collected eight of his nine hits in his first eight games, leading to a .243 average with five RBIs in 14 contests. "He definitely came into camp as a guy we were looking at," manager Jeff Banister told MLB.com. "Our feeling is Willie Calhoun, we've seen what he can do in a batter's box. He has a unique skill set. We challenged him to work on the defensive side of the game. We feel he has growth to do on the defensive side and the offensive side. He's going to be a good player but he's got some work to do on the defensive side." Texas also reassigned pitchers Austin Bibens-Dirkx, Paolo Espino, Reed Garrett, David Hurlbut, Adrian Sampson and Tayler Scott; infielders Christian Lopes and Hanser Alberto; and outfielder Scott Heineman to Minor League camp. Baltimore also sent No. 13 prospect D.J. Stewart to Minor League camp while reassigning right-hander Alec Asher to Triple-A Norfolk. The Tigers made 11 cuts, most notably Jake Rogers, who showed off his prowess behind the plate before being reassigned to Minor League camp. Detroit's No. 5 prospect threw out both would-be basestealers while going 2-for-10 next to the dish. "He's very athletic," manager Ron Gardenhire told MLB.com. "He has all the attributes of a good catcher in the making. I mean, this kid's got tools, really good tools, and he's intelligent behind the plate. Gets a little flashy at times, and I don't ever want to take too much of that away, but there's basic parts where we tried to clean him up a little bit, and he did during Spring Training." Detroit will send No. 11 prospect Mike Gerber to Triple-A Toledo, joined by left-hander Ryan Carpenter and catcher Grayson Greiner. Gerber impressed, batting .250 with four extra-base hits and three walks in 20 at-bats, as well as doing a solid job all over the outfield. "You watch him run the ball down in center, and he could be a center fielder straight up," Gardenhire told the site. "But the more you're able to play, it gives you more options. Especially the way our roster is right now, we need people with versatility that can move around a little bit. We talked to all those guys about those things." Tigers also reassigned No. 20 prospect Sandy Baez and No. 25 prospect Sergio Alcantara to Double-A Erie while sending right-hander Eduardo Jimenez to Class A Advanced Lakeland. Joining Rogers at Minor League camp are pitchers Enrique Burgos, Kevin Comer and Mark Montgomery, as well as catcher Arvicent Perez. After slugging his first two home runs of spring earlier in the day, Jorge Mateo was sent to Triple-A Nashville. The fourth-ranked Athletics prospect was limited to 12 at-bats due to a nagging knee injury. Oakland also sent Ramon Laureano (No. 22), who fractured his left hand on Monday, to Triple-A camp. "It's pretty exciting stuff," A's manager Bob Melvin told MLB.com. "To have that kind of speed and have that kind of power as well, there's some flash to his game, he's got good arm strength. All good stuff. We saw it in BP, but to see it in a game, it's impressive."